Eric Garner died last month after he was put into an illegal chokehold by New York City police officer Daniel Pantaleo. STATEN ISLAND — Thousands of people marched on Saturday for Eric Garner, the 43-year-old black man who died in July after he was put into a chokehold by a white police officer. Earlier this month, Garner's death was ruled a homicide by the New York City medical examiner. The march, which began around 11:30 a.m., was led by Rev. Al Sharpton, former Gov. David Patterson, and members of Garner's family. Protesters chanted "no justice, no peace, no chokehold, release" as well as "hands up, don't shoot," to show solidarity for Michael Brown, the 18-year-old man from Ferguson, Mo. who on Aug. 8 also died as a result of police violence. While initial reports said the NYPD were expecting about 15,000 people, the protest was much smaller. One official told BuzzFeed she thought there were a "few thousand" people. Still, organizers said they were happy with the turnout, and deemed the day a success. People of all ages throughout New York City came out to rally for justice, though some were local residents who knew Eric Garner personally. Local business owner Van Mobley, 55, described Garner as a "pleasant, gentle guy" who had frequented Mobley's Car Wash & Auto Detailing shop over the past year and a half. "Most people try to come in and bargain with me for the prices," said Mobley. "Garner never did, but he had such a good sense of humor that I ended up giving him a discount just for being such a nice guy." Hundreds of young people also attended Sunday's protests, some tagging along with their parents and others alone or with friends, fearful that they might be next. "I feel like I need to wear this everyday," said Tarrell, 22 (left picture, far right), who donned a bright pink "unarmed civilian" sign. "It could have been any of us." Kevin, 20, told BuzzFeed as a victim of police brutality, he felt like he needed to come march. Casey, a 20-year-old who lives "just down the street" from where Garner was killed, said that he was tired of "militarized police," and described Garner as a "neighborhood guy." Dorothy Weems, a Staten Island resident originally from Ohio, said she came out because "I can't keep watching my brothers getting killed." "Police violence in this area is a much bigger issue than just Eric Garner," said Weems, who did not know Garner personally, but frequents the area where he was killed. The day's events remained peaceful, with police saying there was no foul play or reported incidents of violence. At the end of the march, Rev. Al Sharpton spoke alongside members of Garner's family, former Gov. David Patterson, NAACP leaders, and Union Presidents, who all stressed that this was not an "anti-police" march. Rev. 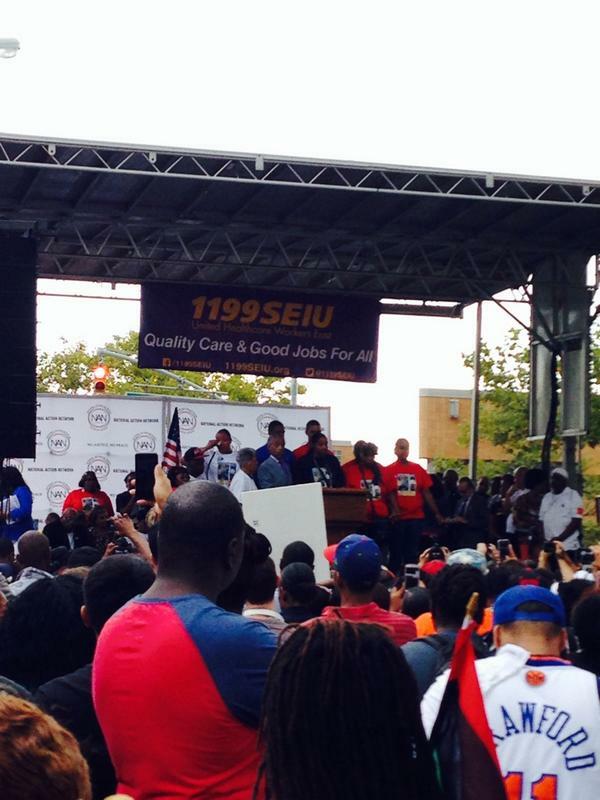 Sharpton takes the stage next to Eric Garner&#39;s wife, mother, and daughter, chants of "no justice, no peace"
Rev. Sharpton takes the stage next to Eric Garner's wife, mother, and daughter, chants of "no justice, no peace"
"We are not hear to cause violence," said Rev. Al Sharpton. "We are here because violence has been caused." His message of non-violence was echoed by many. "A lot of media would like us to be violent, to be animals," the President of SEIU 1199 told the lively crowd. "We are happy to disappoint them today." "This isn't a march against all of the police officers," Eric Garner's mother continued. "Let's remember, some of them are angry too." The crowd was also addressed by Kadiatou Diallo, whose son Amadou was shot 41 times by police when he was unarmed in the Bronx in 1999. "The struggle of justice, the journey of justice, is long," she said. "It's not about black and white. It's not about police. It's about wrong." Several members of Eric Garner's family spoke to the crowd, including his mother, sister, daughter, wife, and cousin, who all thanked the community for their overwhelming support, and praised the man who recorded Garner's murder. Earlier reports said that Michael Brown's family members were expected to march alongside Garner's on Saturday, but nobody from the Brown family spoke at the rally. New York Mayor Bill deBlasio also skipped the march, but said he was communicating with police throughout the day. "I think after any incident like this it's very important that people express their concerns and that there be a real dialogue about where we're going," he said on Saturday after a public event in Park Slope. Despite the medical examiner determining Garner's death a homicide, no charges have been brought against the cop who killed him. Earlier this week Staten Island District Attorney Daniel Donovan announced that a grand jury will consider criminal charges next month.